Stunt Plane is an iPhone game developed by DataInvent Systems. It is accessible on an iPhone, iPod Touch, and iPad and costs $0.99. With multi levels of dangerous stunts to fly through this game is for the Blue Angel wannabe in all of us. This app is simplistic in its makeup and therefore easy to figure out, initially. There are two buttons, an up and down, and then there is a course to undertake. You will either clear the challenge or crash and burn, depending on how developed your steering skills are. The user has a profile view of the plane and all of its obstacles. 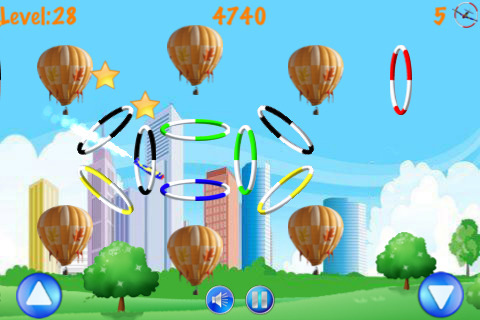 The obstacle course is made up of rings and hot air balloons that the pilot must fly through and avoid, respectively. The best feature of the app is that if you miss a ring you can go back through it backwards. It definitely takes a certain finesse to get the plane through the hoops without losing control and crashing. I am heavy-handed and I tend to press the buttons with too much force, so I have not quite made it past level 4. There are about 30 levels in the game. There is a glitch using the app with iOS 4.0 software and although the iTunes page for Stunt Plane claims that the problem has since been fixed I am still experiencing it on my iPhone. The background of the game is supposed to be a skyline view of some unrecognizable city but with the glitch it is showing up as a black, opaque background with just a few faint outlines of buildings. The foreground of a rolling grass hill with trees is completely unaffected. The game play is also unaltered by the bug so I found that it had absolutely no impact on my enjoyment of the app. If you are a veteran plane flying gamer and you think you have the skill to direct a single engine prop through rings and around an air balloon then by all means purchase this app. I got bored with this game too fast because I was so bad at it. AppSafari review of Stunt Plane was written by Vanessa Paszterko on October 4th, 2010 and categorized under Adventure, App Store, Developers, Games, iPad apps, Universal. Page viewed 4135 times, 1 so far today. Need help on using these apps? Please read the Help Page.